This cozy hat features a classic Norwegian star motif, reworked to include 4 inwardly directed arrows, bordered by a charming peerie pattern. It is designed to be rather long, for a more modern, slouchy fit. You can fold the brim up high when you are in the mood for a snugger fit. 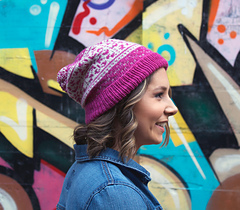 The lovely fair isle is simpler to work than it appears, using only 2 colors and small repeats, making it an excellent project for knitters wanting to take their projects to the next level. 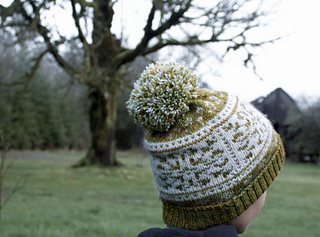 A satisfying knit that works up quickly in lovely DK weight yarn. 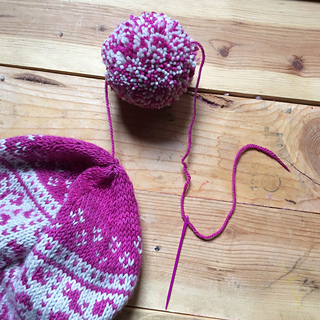 See my blog for tips on fair isle knitting and pompom making! child (17”/ 44 cm), adult (22”, 55cm) Un-stretched circumference after blocking. 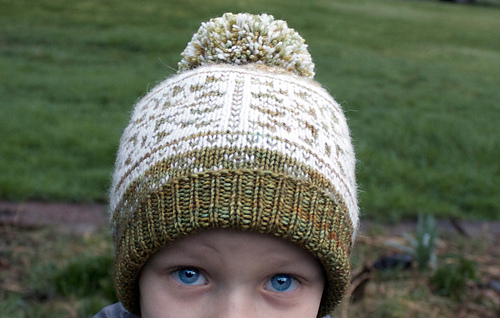 Hat is quite long for a slouchy, modern fit. Yarn: 2 colors of DK or sport weight yarn, approximately 70 yards (90 yards for adult size) of your main/background color, and 50 yards (60 yards for adult size) of your contrasting color. Pink sample uses Swans Island Organic Washable DK in Magenta and Dove. 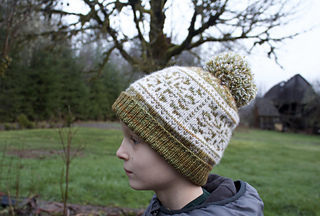 Green sample uses Madelinetosh Tosh DK in Filigree and Antler. Other notions: Tapestry needle, stitch markers, scissors, pompom maker (optional), balloon or bowl for blocking. 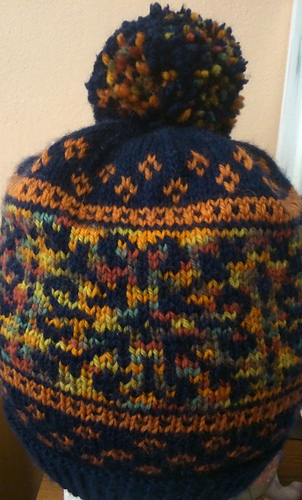 21 sts and 35 rows over 4” (10cm) in fair isle pattern on US 6 (4 mm) needles after blocking.